Ok seriously, the SENDOW Mirror Dual Dash Camera with 7 Inch 1080P IPS Touchscreen has to be one of the coolest things you can put in any car. 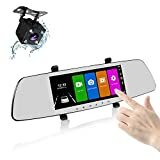 This crazy all-in-one gadget mounts over your existing rearview mirror and connects to a rear-mounted camera to give you a 170-degree wide-angle view of the road behind you. It has an integrated front-facing dash cam as well, but the real fun is the screen itself — it’s a 7-inch high-definition touchscreen that lets you navigate all of the device’s features with ease. 7 INCH TOUCH SCREEN – Owing to 7’’ IPS touch screen, Sendow Dash Camera makes it much easier to navigate and set the multi-function menu. With the high transparency silver mirror, you can get achromatic vision whether day or night, this feature greatly enhances night safe driving. Attn: Upgraded rearview cable lengthens out to 31.2 FT, long enough to install a pickup truck. SUPER PERSPECTIVE – FHD 1080P 6 full glass lens front camera with 170° ultra-wide angle (Avoid A-pillar blind spot, increase your travel safety) + IP65 waterproof 140° rear view camera (Connect red line to reverse light to trigger guide line for safe parking), which presents widest view with full coverage of 6 lanes ahead + oncoming vehicles from behind. ONE-KEY SWITCH 5 VIEWS – Such large mirror screen can display single image with footage from one camera, or four picture-in-picture displays patterns from both cameras recorded simultaneously, with one-key switching five views, you can observe a panorama of the road and surroundings that caught. PARKING MODE & G-SENSOR – Integrated G-sensor will auto-lock recorded video when collision detected, the videos that Sendow dash cam records will be a very important evidence to protect your interests. Turn on parking mode, then dash recorder will come to life and start recording, files are automatically marked and locked for safekeeping whenever an impact is detected. EASY TO GET STARTED – Auto-activated to start recording when powered on. Simply fits over your existing rearview mirror and install the cable inside cabin of your vehicle and plug into car charger port (only supports 12V power supply, vehicles with 24 volt need additional buck converter). 12 months warranty service & professional technical team provides worry-free solutions via zoeysenteam@hotmail.com for 24/7.